In-room kitchen facilities complimentary breakfast and Wi-Fi and a locale off I-44 make for a sweet stay at the Homewood Suites Lawton. Convenience matters at the four-story Homewood Suites which is apparent in the hotel's 88 rooms which all feature full kitchens separate sitting and dining areas sofa beds flat-panel TVs with premium channels free Wi-Fi and DVD players. Each day begins with a complimentary breakfast buffet. 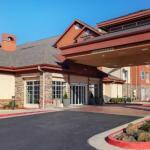 The hotel also provides barbecue grills and a convenience store on-site. When in search of recreation guests find it in the basketball court the seasonal outdoor pool and the fitness center. Guests also have access to a business center and complimentary on-site parking. Located across I-44 from Comanche Nation Casino the Homewood Suites places guests less than four miles from Fort Sill and within 15 miles of historic Medicine Park. The shops and dining spots of Central Mall can be found just one mile west. The hotel is 15 miles from Lake Elmer Thomas Recreation Area and less than four miles northeast of Lawton-Fort Sill Regional Airport.